Once upon a time, it was the official doctrine of the Catholic church that the Pope was a fallible human who made mistakes like everyone else. When the church decided to change that doctrine and create the doctrine of papal infallibility, Lord Acton protested that decision saying, "Power tends to corrupt, and absolute power corrupts absolutely. Great men are almost always bad men." I think some people tend to think this problem is unique to religion, and while there certainly are plenty of examples, it's a mistake to think it's a uniquely religious phenomenon. People in power abusing that power for their own gain happens all the time - politicians, corporate executives, police. It's just something we all have to deal with. Admittedly, most of us don't have to live with the consequences of those abuses of power for five-thousand years. :P I guess the Doctor can relate with Delilah. 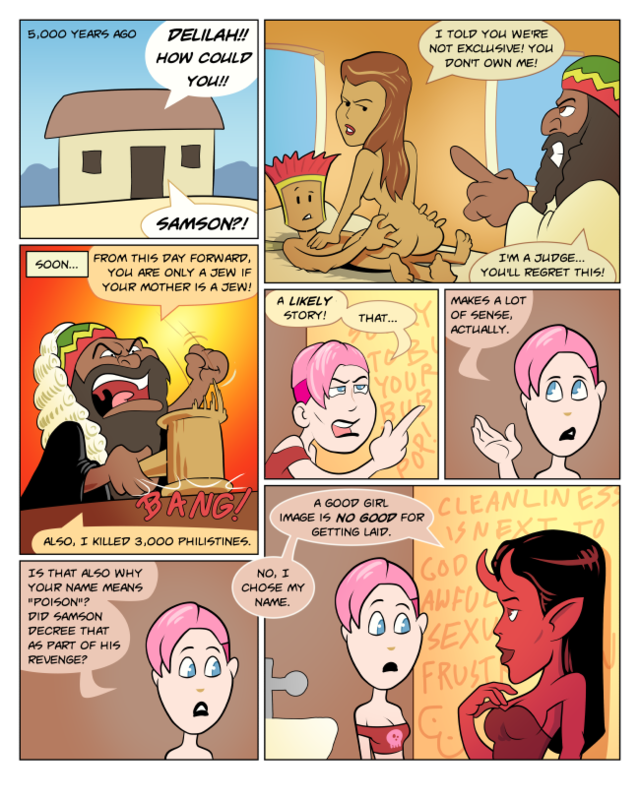 Delilah's account here really should be compared with the official biblical account of those events. And then apply Occam's Razor. Also compare with Trayvon Martin's fictional account of the encounter between him and George Zimmerman. That hat makes him look like a Rastafarian. Are you engaging in some kind of patriarchal cultural appropriation?! Nor did 3,000 BC Jewish "judges" wear black robes and powdered wigs or probably use gavels. They're both silly anachronistic jokes. The word "judge" is a poor translation -- they were more like chieftains. The Rastafarian hat is a joke about the fact that Samson's power came from his hair, or at least from a pact that required he not cut his hair -- therefore since he's black --> dreadlocks --> Rastafarian.